The Garda Siochana (Irish Police Force), Sailing Club was formed in October 1993 to promote sailing and all its benefits among members of the Force. The Force now has two clubs – one on the South Coast and another on the East Coast, based in Dublin. Membership of SCGSC is open to Garda and non-Garda members. If you would like to learn more about what we do please contact us. 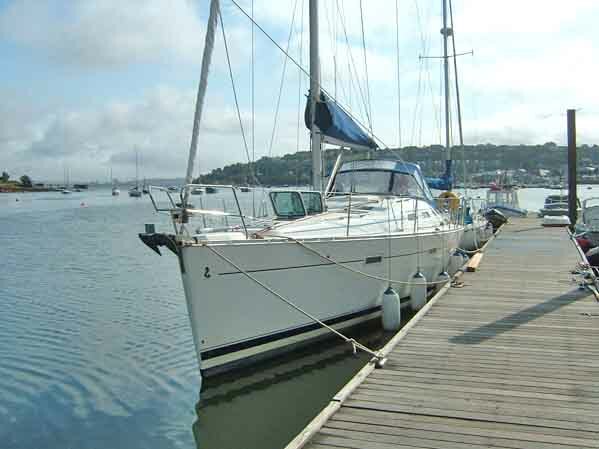 SCGSC is the proud owner s of Explorer, a Beneteau 393, pictured above. 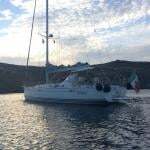 SCGSC has previously owned a Westerly Konsort and a Jeanneau SunFizz. The 2005 cruising programme included a number of cruises on the South West Coast and two aborted cruises to the Isles of Scilly off Cornwall. Even the foolhardy occasionally stay in port in bad weather. In the racing front the club has competed in the Round Ireland and Cork Week races. Already in 2005 the club claims a 3rd place in the Cobh Regatta and third overall in the Cobh Sailing Club September League. We also achieved a notable 6th place in the Royal Cork Yacht Club Autumn League White Fleet. Well done everybody concerned. In racing in 2006 the Club placed 3rd in White Fleet in the annual Blackrock Race, we have also competed in several of the Leagues hosted by Cobh Sailing Club during the summer with notable results. We would welcome contact from other police force sailing clubs internationally. 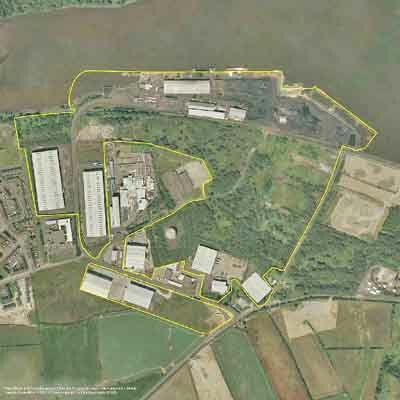 Londonderry Port and Harbour Commissioners manage, maintain and administer the port for the benefit of our stakeholders by placing a strong emphasis on sustainability, and re-investing our profit for growth to benefit future generations. As part of LPHC’s core functions we serve the entire region and promote economic growth and stability – importing over £500m worth of goods into the region last year. LPHC provides a key part of the region’s public infrastructure offering port and marine services to meet our customers’ businesses need. The Port has always recognised that it is a service to our customers and must provide fast, efficient operations to meet our clients’ needs. In the last five years LPHC has developed a new fertiliser blending plant and a new oil terminal facility in conjunction with new and existing customers. LPHC actively supports community and economic entrepreneurship in this area, by mentoring and sponsorship of key enterprise and community projects through our work with Business in the Community. Our mentoring support for projects such as the Playhouse Activity Centre, Beautiful Day Bridal, Blueberries Pine helped develop the businesses in the right direction. This has been recognised by BITCNI with an award for supporting economic growth in Northern Ireland. 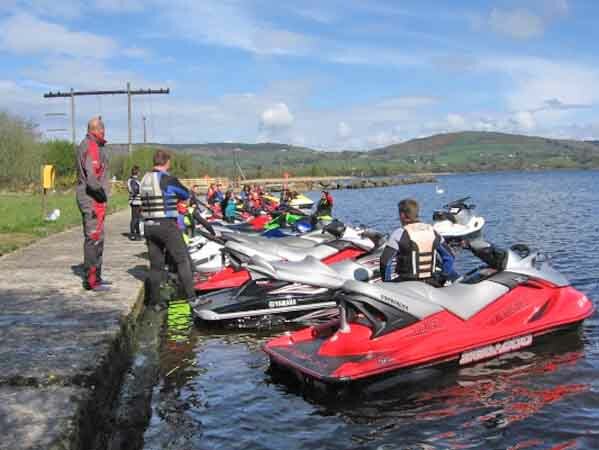 Lough Derg Jet Ski Club has become a reality thanks to a group of Jet Ski enthusiasts who are trying to safeguard the future of their sport, for themselves and for future generations. After hearing the possibility/reality that Personal Water Craft (PWC) and powerboats were going to be banned on our waters, we came to a conclusion that if weren’t proactive about the future of our sport, and build a better relationship with both the general public, local authorities and other users on the water the inevitable was going to happen. A committee was formed on the 26/03/2008 and with the help from Denis Dillon, the Motorboat Development Officer of the ISA, various channels of communications were opened with Waterways Ireland, Local Councils and the Irish Sailing Authority (the national body for boating in Ireland who are actively encouraging and promoting clubs in Ireland) and other authorities. From general feedback from local authorities we understand that they don’t actually want to ban our crafts but it is necessary for them to be able to control and manage their use - which is not possible on an individual basis. In the UK the PWC users were looking at a similar ban until they formed clubs and took responsibility for their sport and became accountable to uphold certain standards, rules and regulations for their members. Our Aim is to secure the future of our sport by developing our relationship with the relevant authorities, to show them that by promoting safe and considerate use of PWSs within club structures, is the way forward, to benefit all involved. 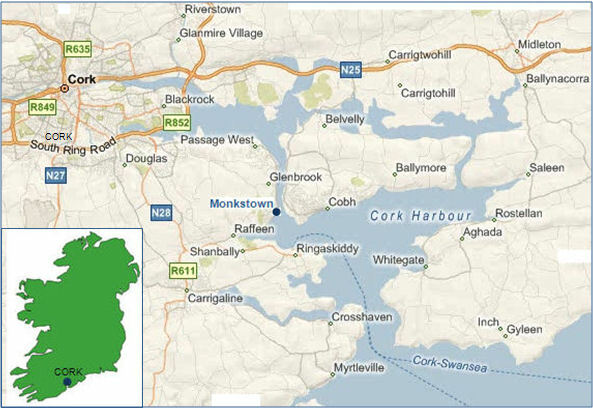 Monkstown Bay Sailing Club is located in the picturesque village of Monkstown, which overlooks Monkstown Bay in Cork Harbour. 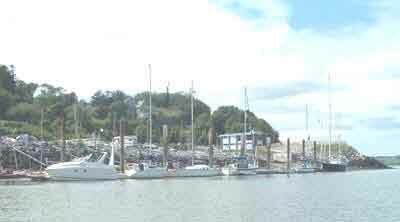 Dingy league races are generally held within the Bay area, while Cruiser league races extend their reach up river to Passage and out the harbour to Cobh, Whitegate and beyond. Weekend events make full use of the Harbour waters, including races to Blackrock, East Ferry and Ballynacorra, and trips to Whitebay and Crosshaven. Dinghy sailing club with racing every Tuesday and Friday. All classes welcome. Annual junior training programme run during July. Clubhouse and usual facilities. Membership open. Dinghy courses offered up to Improving Skill, Advanced Boat Handling, and Racing 1. The principal activities of the Irish Offshore Powerboat Racing Club include the promotion and encouragement of Powerboat Racing in Ireland and of social union amoung the Club's members. Today sees the launch of the 1st Round Ireland Offshore Powerboat Race, which is confirmed to take place from the 5th to the 12th of June 2010. This 2010 race will circumnavigate the entire coast of Ireland and will be the toughest endurance powerboat race on the International circuit. Irelands varied coastline will prove a severe test for even the most experienced powerboat enthusiasts with the Atlantic leg being unique to world racing. The race is being organised by the Irish Offshore Powerboat Racing Club in conjunction with the Irish Sailing Association and the UIM, the International Powerboat Racing Authority. The race will be run under the international rules of the UIM and working closely with the ISA the organisers will ensure that all safety, marine and environmental conventions are correctly observed. The 2010 Race will be an International event with competitors coming from all over the world. The five days of racing will be a true test of man and machine. There will be 4 days with stages ranging from 180 to 210 miles each day. Not for the faint hearted. Mid way there will a short course race with a circuit of between 70 and 100 miles, but where time will also be allowed for repairs and some Irish hospitality. The intention is to create a showpiece event both on and off the water that will highlight Ireland and our marine and boating Tourism potential. The event will offer the Powerboat racing community opportunities to showcase Ireland on an International stage. The 4 venues currently being organised will not only facilitate the requirements of offshore powerboat racing but also the on-shore activities that will be organised as part of the event. The germ of ISORA started after the war when Irish Sea racing was at an extremely low ebb, although there was a tradition of such races such as the Tranmere Sailing Club's Midnight Race, run since 1907, and the Llandudno Race run by the Royal Mersey Yacht Club as a feeder race for the Menai Straits Regatta. "The purpose of the committee is to assist and encourage clubs in the Merseyside and North Wales area in the sponsoring of offshore races in the Irish Sea under the RORC rating and time scale. The Committee, which is composed of representatives of the RORC and certain local clubs, does not sponsor races itself. Offers from clubs in the district to sponsor such races will be very welcome, and every possible assistance will be given". The statement of intent has been the basis os all our subsequent activities. Originally the races were confined to those offered by the Royal Mersey, Tramere, Royal Welsh, Royal Anglessey and Royal Dee Clubs, but by 1960 the objective of widened interest was being achieved and extra races under the burgee of South Caerarvonshire Yacht Club and Holyhead Sailing Club were included. The Merseyside and North Wales Joint Offshore Co-ordinating Committee continued to provide a central administration for all this activity, which by 1963 increasedto no less than twenty-one races. Such a programme was beyond the scope of the secretariat and it was feared that the original object of fostering interest might well be defeated through inadequate organisation. To organise, with the help of elected clubs, five offshore races each year. Four of those races were to be in excess of 70 miles, i.e. definitely offshore, and the fifth to be a RORC race in excess of 200 miles. Still based mainly along the Lancashire and North Wales coastline, NWOA continued along the lines laid down by the founders, although a sixth race - the Tod Trophy, was included at a later date to allow the ever increasing 'B' fleet to have racing while their larger sisters were away taking part in the annual RORC event. Over the years it has become obvious that as well as good support for our races from the eastern shores of the Irish Sea, an increasing number of entries were from the Dublin Bay area. In 1971 these Irish entries equalled in number those from all other home ports. It seems that once again the time had come to see if the NWOA needed bringing up to date, and so in line with tradition, a meeting was called at the Royal Mersey Yacht Club, to which representatives of almost every club around the shores of the Irish Sea were invited. It was suggested that it was time that the NWOA should widen its sphere of activity to include this whole area and representatives from the Ribble, Mersey, the Menai Straits, Anglesey, Cardigan Bay and the Isle of Man and the whole of Ireland's east coast agreed that this was a good idea, and an attempt should be made to produce an integrated racing programme over this area. It was decided to change the name to the 'Irish Sea Offshore Racing Association' as the most suitable indication of the area in which the clubs are situated. It was also decided that it would be possible to extend the racing programme to include boats from the Isle of Man, the North of Ireland and the Ribble without seriously changing the traditional races (which had been enjoyed so much over the past few years), by including races which the clubs in these areas had run in the past and in which boats from each area should be asked to travel to starts away from home twice, take part in a RORC race (or its small equivalent) as well as starting twice from their home ports. It was also agreed that in 1972 racing should be offered for a third class - namely class 'C' entries to which would be restricted to boats that had not got divided underwater profiles. At the beginning of the 1972 season, Sandy Taggart from the Clyde approached the English part of the association and asked if we would be willing to include certain Clyde races in our programme and this we agreed to do so. Since the early 70s a week-long offshore regatta has become popular and developed – The Captains Cup in the South of the Irish Sea and the Comet Wheel Series on the Clyde. From these two events the bienniel ISORA Race Week evolved. 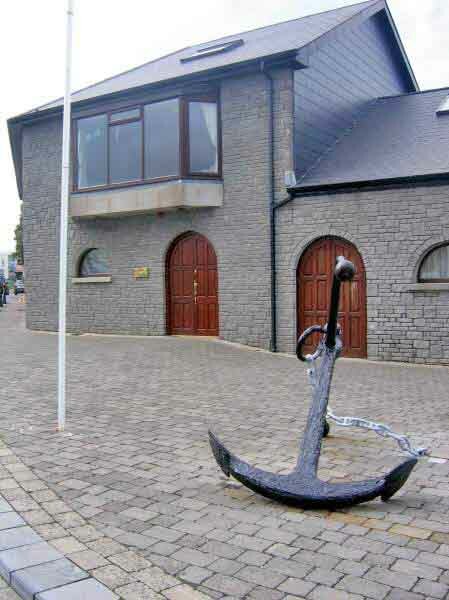 Dungarvan has always been noted for its sailors and its great sea-faring families and the tradition of the bygone days of the coastal schooners is reflected there today in the strong active sailing club which was founded at a public meeting in the Town Hall on Friday 2nd August 1946. The first officers were Bernard Mulcahy, Commodore, Reveille Farrell, Vice Commodore, Maurice Kiely, Secretary and Joe Donovan, Treasurer. The inaugural race of the club, for the newly presented Mulcahy Cup, was held over a 6½ mile course with a fleet of four boats; Mairead built by Tyrells and owned by Bernard Mulcahy, Maise formerly of Dublin owned by Maurice and Peter Kiely, Naomh Breandáin owned by Gerard Walsh, and Jane Shore owned by James Villiers Stuart. The race was won by Maurice and Peter Kiely. Helvick based boats then showed an interest and these craft, mostly gaff rigged salmon boats crewed by fishermen from the Helvick and Ring Gaeltacht, were usually well placed. Amongst these 'Pauls Boat' and 'Slatterys Boat' were outstanding, leaving the 'yachts' a poor second on more than one occasion. In 1948 Reveille Farrell bought Susanna, a nine-ton Bermudan cutter designed by Norman Dallimore and built in 1936. She was to become well known for her many cruises to the West Coast of Ireland, in the English Channel, and Brittany. The most famous of these was in June 1957 when accompanied by Gerard Walsh and John Ballot she sailed to Spain and back. This was a considerable achievement at the time as it was believed that the passage across the Bay of Biscay and back again was beyond the capacity of the average cruising yacht in the normal holiday period. Coincidental with the arrival of “Susanna” some of the older boats changed hands and were lost to the club and big boat racing activity declined. They were replaced by a number of one man canvas sailing canoes, owned and frequently capsized by Col. Jack Hockin, Maurice Kiely, and Tim MacCarthy – which were the beginnings of dinghy sailing in Dungarvan Harbour. During the winter of 1958, John and Austin Flynn built a 16’ hard chine Petrel class dinghy from plans in an American magazine. 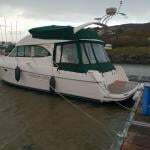 Because the design was ideally suited for home construction many Petrels quickly followed and dinghy sailing really became established in Dungarvan. There was great rivalry and competition in the fleet and each new boat came with a further refinement or new 'secret weapon' not seen on previous models. Construction methods changed from larch planking and cotton sails to plywood and terylene. In all 50 boats of the class are known to have been built, the later ones of GRP construction. An unfortunate drawback of the Petrel was the fact it was unique to Dungarvan and those interested in inter club competition had to look to other designs to compete nationally. GP14s were popular for a while during which period the club hosted the Purcell trophy. 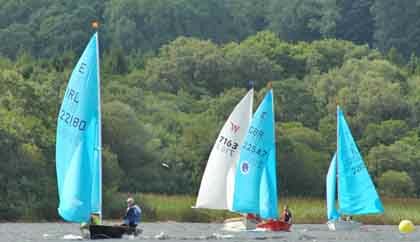 Nowadays the dinghy fleet comprises of Wayfarers, Lasers, Mirrors and Toppers sailed by a very active junior section. The cruiser fleet has also expanded and the burgee of DHSC has been carried far afield and its members have logged many miles from Cape Horn to the Northern Latitudes. Although once a busy commercial port, Dungarvan in common with many other ports of its size suffered when changes in shipping practices led to a decline in the number of vessels using the port and with trade totally finished many of the old warehouses along the quayside became derelict. Reconstruction has injected new life into this area of the town and created the opportunity for Dungarvan Harbour Sailing Club to acquire a site on the quay front on which to build a clubhouse which is now the focal point of club activities. The Town Council is currently progressing the construction of a marina, which together with the abundance of new restaurants and other onshore facilities available will firmly establish Dungarvan as a compulsory stopover for cruising yachts and greatly ease the current shortage of mooring space in the harbour. DHSC is a family orientated club. Visitors by road and sea are welcome. Pontoons at quayside. Showers and toilets available in the Clubhouse to visitors. The Clubhouse and bar are open at the weekend from 5pm throughout the year, dinghy and cruiser racing and cruising in company during the summer. Páirc báid ag Sean Céibh an Spidéil. Seoladh gach deire eachtain agus trathnóna amháin i rith na seachtaine. Failte faoi leith chuig daoine agus atá taithí seol acu. Cursaí sheoil ar fáil i rith an samhradh.